Soy burgers make a healthy meal. If you enjoy soy burgers, recipes are available for both vegetarian and vegan options. Shop bought alternatives are also widely available, giving a convenient alternative to making your own from scratch. Soy burgers are a useful addition to a vegetarian or vegan diet. Not only are they a tasty and nutritional treat, they are also a useful stand-by for barbecues and picnics as an alternative to meat-based products. As the name suggests, soy burgers are made using soybeans. Some soy burgers are made using mashed soybeans whereas others use TVP or textured vegetable protein (or TSP, textured soy protein) which is derived from the soybean. Both forms are equally nutritious and tasty, although with slightly different textures. Soy burgers can be made at home or purchased ready made from stores. Soy burgers are readily available from stores. They are available in dried, chilled, canned and frozen forms. Some products that are labeled as 'veggie burgers' will contain soy or soy products. Not all shop bought soy burgers will be suitable for vegans. Some may contain eggs or dairy products, therefore vegans should read the labels carefully. Using soy burgers as a ground or minced meat alternative - soy burgers can be crumbled and used to make dishes such as shepherds pie, moussaka and lasagna. This is a convenient and quick way to make a vegetarian or vegan substitute, however do remember that the burgers will have a distinctive taste that may alter the flavor of the finished dish. Soy burger casseroles and stews - soy burgers can be used as a protein source in casseroles and stews. Many casserole and stew recipes can be adapted giving a warming and hearty vegetarian and vegan meal option. 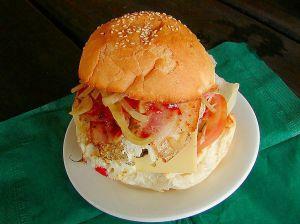 Roasts and loaves - soy burger mix can be used as a meat alternative in many roast and meat loaf dishes. Soy burgers are ideal for serving at barbecues. Some soy burgers, however, can crumble which makes them difficult to cook over an open grill. If this is the case, try cooking the burgers in a frying pan first with a little oil and then cooking them over a barbecue. Other interesting vegetarian and vegan dishes that are great for barbecues and outdoor parties include bean burgers, marinated tofu and vegetable burgers. If you enjoy soy burgers, recipes for making your own or creating special soy burger dishes can provide a healthy and tasty alternative to meat-based dishes.